Yes! Taking care of the delicate eye area is important in order to prevent the signs of ageing. The skin around the eyes is fragile and often shows signs of ageing before any of the other facial areas, so I would advise using a preventative eye skincare treatment from as early as your 20s. As most of the damage is caused by UV rays & environmental stresses, in your twenties when applying your vitamin C in the morning, I would recommended to apply it around the eye area as well (as long as there is no irritation). Don't forget to follow with a broad spectrum high SPF eye sunscreen or mineral sunscreen. How about SkinCeuticals Mineral Eye UV Defense SPF 30? Or Medik8 Advanced Day Eye Protect. In your 30s you tend to start to seeing the first visible signs of ageing. Using an eye cream daily or even twice daily to help keep the skin elastic and prevent collagen loss around the eye would be beneficial. Choose your eye product wisely! The skin around your eyes is much thinner, so it's prone to irritation and may cause milia around the eye area from using rich moisturising creams. Facial products, especially cosmeceuticals are formulated well and contain strong active ingredients to target specific concerns, so they would be too potent for the eye area. When you're in your 30s, you're more likely to have specific eye area concerns like fine lines, dark circles and puffiness that would require eye products specially formulated with ingredients to target those concerns. That's why it's so important to use the correct eye product. If you have puffy skin around the eyes, use an eye cream that contains caffeine which allows a temporary de-puffing by constricting blood vessels in the area. For example, try SkinCeuticals AOX+ Eye Gel. For dark circles go for an eye product which contains ingredients such as vitamin C, licorice, Kojic acid, Chromabright or niacinamide which inhibit melanin production. For example, try Jan Marini Luminate Eye Gel. Other ingredients such as Vitamin K can help, it's an antioxidant that strengthens the capillaries under the eyes. 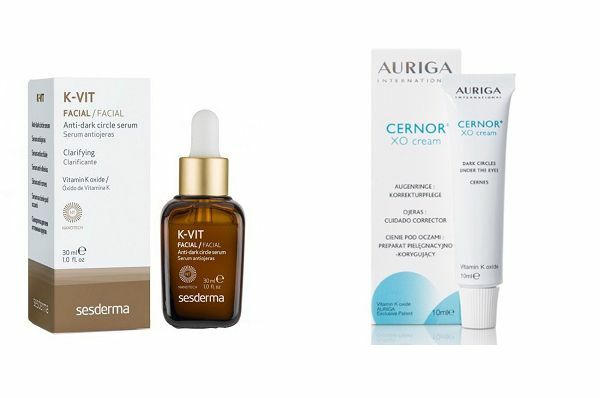 Our top Vitamin K eye serums are Aestheticare Auriga International Cernox XO Gel or Sesderma K-VIT Anti-Dark Circle Serum. Please bear in mind that dark circles are very difficult to treat. It also has a lot to do with your diet and lifestyle. Look for eye products that contain Retinol (Vitamin A) that help with lines & wrinkles. Make sure the retinol eye products are formulated just for the delicate eye area. For example the Medik8 Retinol Eye TR or Medik8 Advanced Night Eye. Vitamin C encourages collagen production & also brightens the skin. 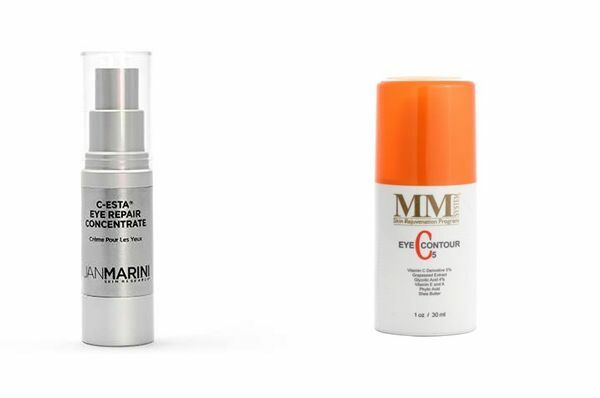 You could try the Jan Marini C-ESTA Eye Repair Concentrate or Mene & Moy Eye Contour C5. Peptide eye products tell fibroblasts in the skin to create more collagen so the skin becomes suppler and firmer which is the main reason why peptides should be in your eye cream. 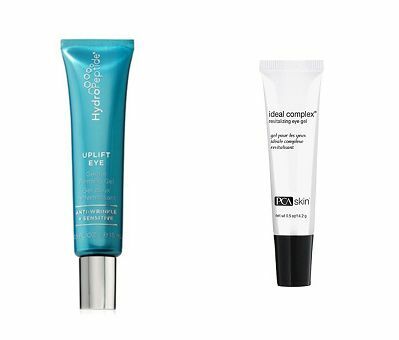 For example the HydroPeptide Uplift Eye Gel or PCA Skin Ideal Complex Revitalizing Eye Gel. Growth factors will help to decrease fine lines and wrinkles as well as thicken the very thin skin beneath the eyes. 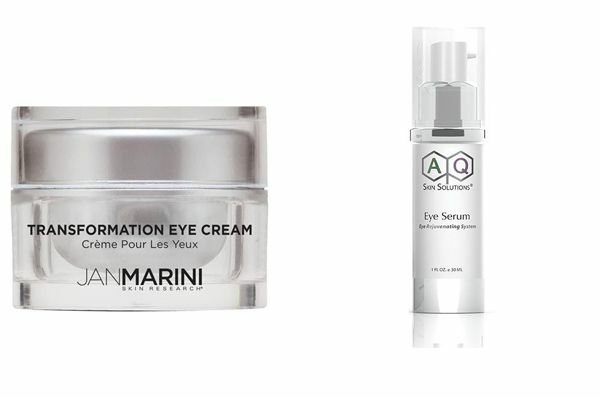 Try the Jan Marini Transformation Eye Cream or AQ Skin Solutions Eye Serum. The more that any of the anti-ageing ingredients mentioned above are included in your eye creams the better. If the eye area is sagging/baggy I am afraid an eye cream cannot help. Only surgery will help remove that excess skin. If the skin around your eyes is drier, then you need hydrating ingredients like HA (Hyaluronic Acid). HA is great as it is a hydrating ingredient but not too heavy. Obviously if you need something more hydrating, then go for an emollient type of eye cream like a balm or a product that contains vitamin E. Be careful not to go too heavy if you don't need to as it may cause milia around the eye area. Our top Hyaluronic Acid eye product pick is the Teoxane R[II] Eye Contour. For a richer eye cream try SkinCeuticals A.G.E. Eye Complex or SkinCeuticals Eye Balm. You do not need to use too much - just a pea sized amount will suffice. Apply using your ring finger for a light touch. Dab small dots under and around your eyes and on the brow bone. Don't rub or stretch or pull the skin. It's vital that you protect your skin daily against the sun. This also applies to the skin around the eyes. The problems of wrinkles, dark circles, etc. will only get worse if you go out without sun protection. Use either an eye SPF sunscreen or a mineral SPF sunscreen or make sure that your concealer is a minimum of SPF30 or higher. And lastly don't forget to wear sunglasses. The most important thing to remember when choosing your eye cream is to make sure it's well formulated. That means choosing a cosmeceuticals brand that uses evidence based ingredients with enough active ingredients to target these issues. Most cosmeceuticals products are backed by science and not marketing rubbish. Remember that high street brands and department store skincare products don't contain enough ingredients to have a noticable effect on the skin. - contains vitamins A, C and E.
Uplift eye immediately soothes and comforts tired, sensitive eyes while minimizing the appearance of crepiness, puffiness, fine line and wrinkles. - Suitable for any skin type .